Buy Buy Baby offers products for all the needs of newborns. The store’s offerings include furniture, bedding, car seats, booster seats, highchairs, strollers, swings, diapers, clothing, lotions, formula, learning and more. 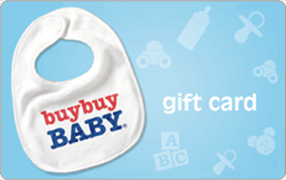 Parents can use Buy Buy Baby Gift Cards at more than 90 locations nationwide and at BuyBuyBaby.com. Sell Buy Buy Baby gift cards on Cardpool.